What do you do when severe weather threatens your golf course? A severe weather safety checklist for golf courses is something every club needs. It doesn’t matter if you’re a private club or a public course: Severe weather is a threat to everyone. While there is no weather safety solution that fits every golf course, the best route to safety is always preparedness. The following checklist was developed by the weather experts here at Earth Networks. This severe weather safety checklist for golf courses is designed to help golf course managers and superintendents understand what’s needed for an effective plan. Keep reading to see where your club is on the scorecard and how you can implement a severe weather safety plan that works for your course. If at any time while reading you have any questions regarding this checklist, please enter them in the comments section below. One of our meteorologists or golf specialists can then answer your question. The first item on any severe weather safety checklist is to know your threats. If you’re near the coast, hurricanes could be a big issue for your club. If you’re in the Midwest, your greatest threat could be tornadoes. Clubs in the northernmost areas of the country focus on snowstorms and other damaging types of winter weather. Regardless of your obvious threats, it’s also important to plan for the more common severe weather conditions as well. For example, thunderstorms can happen nearly anywhere at any time. Every golf course, no matter the size, should have a plan for thunderstorms. Take some time to list out of all the possible severe weather threats in your area. That way, you can plan to protect your property and golfers from them. You can also include this list with each event defined in your severe weather safety plan. Once you have a list, it’s time to take action. When severe weather threatens your golf course you have to act quickly to protect property, people, and finances. If you do not currently have a severe weather action plan for your golf course, developing a plan will be a large part of your preparedness work. In fact, you can even use this checklist as part of your plan. Make sure your severe weather safety plan includes specific actions for different times, stakeholders, and warning levels. A lot of country clubs have different phases for 72, 48, and 24 hours before a storm. The rest of the items on this checklist will relate to your action plan. If you already have an action plan, great! Go through this checklist and make sure every item is addressed. If you don’t have an action plan yet that’s OK! Get out a fresh piece of paper or a new document on your computer and start making notes so you can draft the perfect severe weather safety plan for your golf course. The most important thing that all weather safety plans need is reliable weather data. You can’t make life-or-death operational decisions with faulty or free weather information. Why can’t you rely on free weather applications and websites? First of all, these devices often don’t update quickly enough to reflect the current weather conditions. When severe weather closes in on your golf course minutes matters. 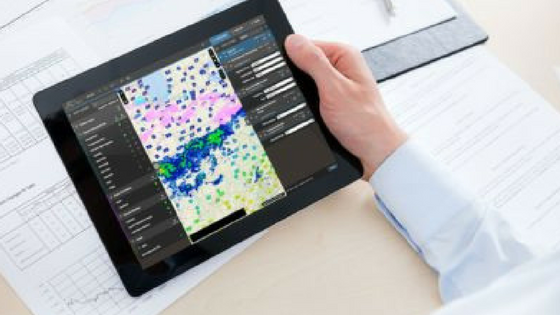 You need the most accurate weather data to help you make the best operational decisions. Secondly, these weather data sources also don’t gather information from your specific location. We don’t need to tell you that weather conditions can differ from town to town or even from hole to hole at your golf course! The problem with free weather data is that it’s typically sourced from pretty far away. 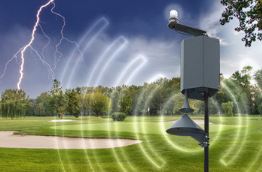 A lot of these apps have sensors at your nearest airport, but unless you’re right next door to that airport the weather data simply doesn’t apply to your golf course. You need hyperlocal weather data to protect your golf course. When you rely on a paid network, you know you’re getting verified weather information. A commercial-grade weather data provider will also help you monitor the storm as it approaches and then leaves your golf course. 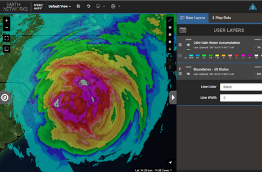 Weather maps help storm spotters understand weather risks that aren’t always immediate. That way, you can give staff and golfers more time to prepare. Once you have the right data to make decisions with you need to notify everyone and get them out of harm’s way. There are a couple different ways you can receive weather alerts. We’ll go over some tried and trusted ways. The first is an outdoor alerting system with a horn and strobe light that relies on total lightning detection. These are loud, impossible to ignore, and send clear danger and all clear messages. Solutions that claim to use lightning prediction are not best practice. This is because lightning prediction doesn’t actually pinpoint lightning strikes. It just picks up electrostatic energy in the air and guesses which are lightning strikes. These types of prediction systems lead to a lot of false and missed alarms. Not to mention, these systems often need special upkeep but don’t come backed by seasoned technicians. If you’d like to learn more about the striking differences between lightning detection and lightning prediction, you can read our free ebook below and become an expert on the subject. 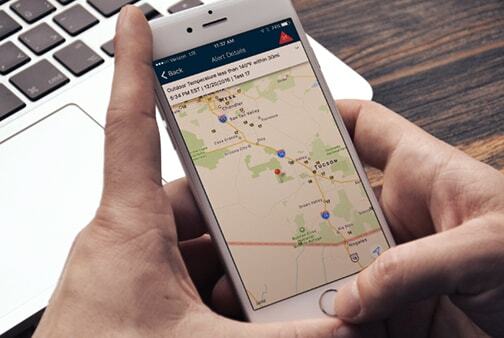 Two other alerting systems that work well on golf courses are text and email alerts. In today’s digital age, mostly everyone has a cell phone. Even more of those cell phones are smart phones. That makes text and email alerts a runner-up as the second best way to alert everyone of incoming weather. As long as you’re using accurate data and alerts that are not human-based you are doing a good job alerting everyone. By the way, when we say “human-based” we’re talking about this type of situation: Someone at your pro shop is watching the radar then heads outside on a golf course and tries to round up golfers as rain is already falling. This puts everyone at risk and slows down the entire weather safety process. Whatever you do, don’t rely on this method or lightning prediction. Once everyone knows of an incoming severe weather threat, they must seek shelter. Unfortunately for those on golf courses, sometimes shelters can be few and far between. Most of the time, golf courses need more lead time to warn guests about incoming weather because of this reason. Knowing where your shelters are and how long it takes for people to reach them either by foot or by cart (if applicable) is key in determining your alert radius and lead time. Once you’ve identified your shelters, you should also tell everyone which areas they are and why. 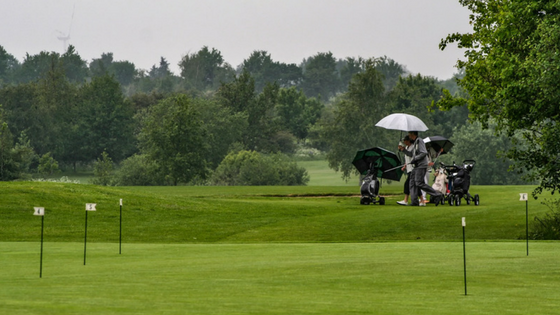 Remind golfers that umbrellas, tents, and golf carts are not severe weather safe shelters. Your severe weather safety plan can’t start until someone or something activates it. You can take care of all the previous items on this list, but if you don’t have a system for starting your plan, it can’t do you any good. Some clubs rely on employees on pro shop staff or on the golf course superintendent, but those options aren’t best practice. In today’s day and age, there are only two acceptable parties you should rely on for starting your emergency weather plan. The first is an expert meteorologist. The second is an automated piece of equipment connected to a real-time, hyperlocal weather network. 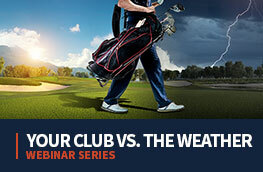 These are the two most reliable ways to protect everyone at your club from the dangerous impacts of severe weather. Practice makes perfect for both golf and severe weather safety. One of the most important items on the severe weather safety checklist for golf courses is to practice. Just like a fire drill, you should have regular severe weather drills to help staff, golfers, and other guests understand what to do in a real-life weather emergency. Run-through’s will help familiarize everyone with your severe weather warning systems, protocol, and shelter areas. Practicing also can help your club identify any areas of your plan that need improvement. Maybe the designated shelter for those on hole 12 is the closest on paper but requires golfers to walk through wooded areas. Little things that make a big difference will be easier to spot during drills. When you have to put your severe weather safety plan into action for real, the last step on the checklist is damage assessment. 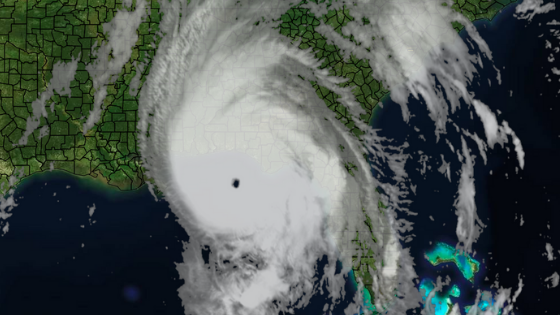 If a severe weather event like a thunderstorm, hurricane, or tornado does impact your club, you’ll need to assess the damage as soon as conditions are safe. Once you hear the all clear call you can head out of your shelter and assess all the other shelters to ensure that those inside can exit safely. 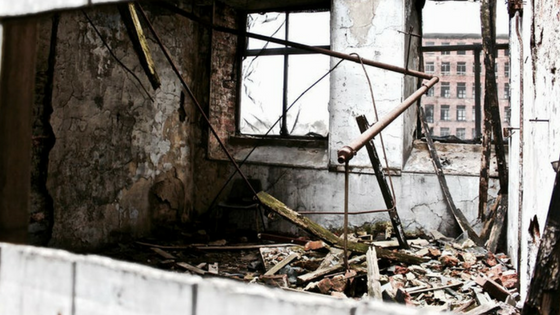 Then you should conduct an entire sweep of your golf course and buildings to check for any damage. You may have trees or branches down on certain holes. Maybe you lost power. Perhaps flying debris damaged your clubhouse or a few cars in the parking lot. It’s important to list everything. For insurance purposes, we recommend taking pictures before a severe storm and then taking those same photos after to show the difference. Does your golf club already use a severe weather safety checklist? Then we want to hear from you! Comment below and tell us if there are any items we missed on our checklist. You can also use the comments section as a way to ask any questions to our weather experts. One of our meteorologists or club safety specialists will answer your inquiries as soon as possible! If you don’t have a severe weather safety checklist, please let us know if you’ll be using this template and if there’s any other information we can provide. Thanks for reading and we’re proud of your for taking an important first step in protecting your golf club from severe weather!